Look at these two guys: Prince Charming with not a hair out of place and Lex Luthor with not a hair. How could two such dissimilar douches be so alike? They’re politicians! South of the border a recent case involving scuzzy activity concerned “Blago”. 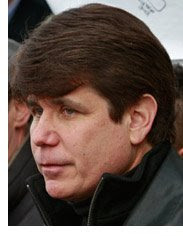 That’s the name used by the media to describe former Illinois Governor Rod Blagojevich. What was he charged with ? Oh nothing much, just: conspiracy to commit mail and wire fraud and solicitation of bribery. That’s the formal Justice Department complaint that alleges that the governor conspired to commit several "pay-to-play” schemes, including attempting to sell Barack Obama’s vacated Senate seat to the highest bidder. We’re not immune to similar shenanigans north of the border. 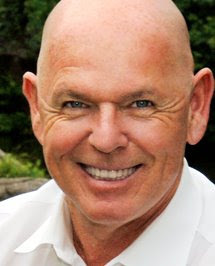 In court this week is Larry O’Brien, the mayor of Ottawa, Canada’s capital city. The local media, intent on showing respect, call him “Larry the Mayor Guy”. And what’s he charged with? Kind of a “pay-to-not-play” , if you will. He’s charged with influence peddling in his alleged attempt to buy off an opponent in his electoral bid with cash and a federal appointment. These two cases, while in separate countries point to the seamy, sleazy similarities that a sizeable chunk of the electorate, I’m afraid, perceives exist in the wonderful world of politics. And both these guys, while faced with criminal charges and public opinion in favour of them stepping down, clung to office instead of doing the noble thing. Blago was finally impeached and now awaits his reality show break, confident he won’t do prison time. Larry the Mayor Guy only took a leave of absence to appear in court this week, confident he’ll soon be back wearing the chain of office again as opposed to breaking his back working on the chain gang. Ah politics, the more America (and Canada) wants change, the more things remain the same. Ah, well said! Sad, but true. Quirky: Every week there's another story. It's amazing.